Denver, Colorado, can experience some of the most intense and unpredictable weather no matter what time of year it is. These conditions can pose a challenge to both property managers and roofing contractors alike. A mix of hot temperatures, freezing rain, snow storms, heavy wind and hail can affect the performance of a roof and cut its lifespan short. Fortunately, choosing the right roof system can help alleviate the damages that severe weather may cause to a building’s roof. The Denver Public Schools system is no stranger to harsh weather or battered roofs. 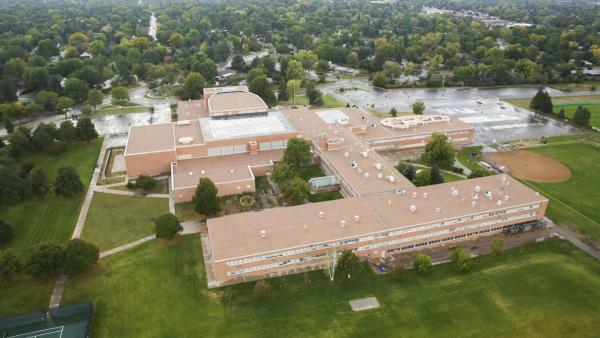 After 25 years of enduring the extreme Denver climate, the roof of Thomas Jefferson High School in Southmoor Park had begun to show signs of age and was at risk of leaking. An inspection of the roof determined that it only had a few good years left, so the school district decided to replace it before it reached a critical stage. The only problem was that the roof replacement job would have to be completed before school was back in session in September. D&D Roofing needed to tear off and install a new roof in just three months. Fortunately, the choice of which roofing system to use was an easy one. A BUR asphalt roofing system was able to provide the school district with peace of mind knowing the building was protected by multiple durable and water-resistant layers, while still meeting budget requirements. In order to meet the short timeline for the project, which required 126,700 square feet, D&D Roofing relied on two 15-person crews working 10 hours a day, five days a week from June to early August. The contractors tore off the existing BUR roofing system down to the lightweight insulating concrete beneath. Any damaged or wet concrete was replaced with Johns Manville (JM) ENRGY 3® insulation followed by a 6” wood nailer at the perimeter where it was needed to reach the required height. The next layer was comprised of JM GLASPLY® Premier Type VI Felt with 1.7″ JM Lightweight Concrete fasteners. Finally two layers of 1.5” ENRGY 3® insulation, a JM Perlite Cover Board and four plies of JM GLASPLY® Premier Type VI felt were mopped on in hot asphalt and coated in gravel. D&D ended up completing the project two weeks ahead of schedule by installing about 4000 square feet per week, according to Beckham. The new BUR system installed on Thomas Jefferson High School successfully met energy-efficiency standards and low maintenance cost requirements, while providing the durability and high-performance of an asphalt roofing system that was needed to protect the building from intense year-round weather. The Denver Public Schools district was well-aware of the benefits the multi-layer, protective asphalt system would provide. Their maintenance crews oversee more than 100 buildings, and they knew that by adding a durable roofing system they would be able to cut down on the repair calls and have time to focus on other capital improvements in the school district. The roof of Thomas Jefferson High School has gained praise on a national level from the Asphalt Roofing Manufacturers Association (ARMA). The trade association’s Quality Asphalt Roofing Case Study (QARC) Awards Program honors the top asphalt roofing projects in North America for their beauty, affordability and reliability. The high school’s new roof exemplified these qualities through its ability to solve a key issue for the building owner. In January 2015, D&D Roofing was honored with a Gold QARC Award for the project. By installing a reliable asphalt roofing system and working around the clock, D&D Roofing was able to complete a large project on a tight deadline and provide a system that would protect the school and its occupants for decades to come.